Two teams of mercenaries vie for control of a cluster of NULL cannons within a central part of this region. Turrets and other installations will be deployed from orbit to reinforce the team deployment areas as the battle progresses. The battle continues until one of the MCCs is destroyed or until one side depletes the otherGÇÖs clone supply. Map is unbalanced, first team to control two objectives keeps them for most of the game. A and C are easy to hold together, and forget about B mostly since there is very little cover leading to or away from it. Spawning at B is a death sentence whilst the team hold A and C.
The CRU near C is not great, actually kinda pointless. It doesn't give a losing team a place to hack and then spawn into since it it too close to C. And the winning team don't need it since they can already spawn in the city. I'd rather you swapped the CRU and the Supply depot around, and gave the new CRU position more cover. This would be more enjoyable if blueberries were smarter. The first side to destroy all the enemy turrets loses the massive disadvantage of not being able to safely bring out a vehicle. Miserable variation on a great map. Locking opposing team out of the game is far too easy, and efforts at infiltration are frustrated by the "battle in a bottle" quality of the map. Kick the other team out and fortify the interior, and you've as good as won. It's a waste of time for all concerned. For the love of God, please cut this one from the rotation. Whoever gets the city can lock out the other team. 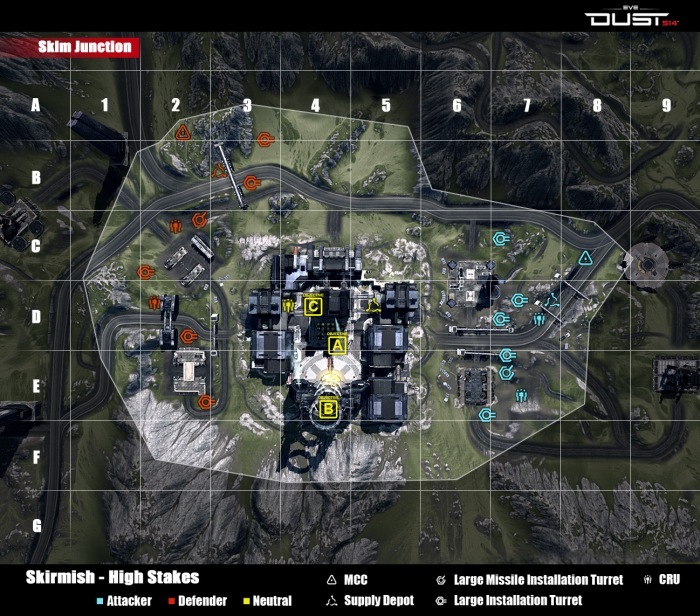 This map is basically king of the hill, with a MASSIVE advantage for the one on the hill. Now, if both inside and outside had 3 cannons, this might work better. Alternatively, an additional CRU near an additional path into the city might help. I'm having this bug, I get stuck at the Supply Depot at D7. When I change dropsuit, I respawn at the corner and I can't move. I've changed dropsuit again, but I stay stuck. My usual solution is to switch to a BPO suit and overcook a grenade. on corp wars this map still have problem with FPS and broken sound of fire. Especially in D4 square, maybe because it is most visited square. Trying to jump between the wall and stationary vehicle just south of Objective A will cause you to clip through the map and fall to your death.